Oh wow, do I ever think this shirt is hideous – but it is certainly eye-catching. This shirt is very bright yellow and light blue plaid. The blue stripes in groups of four lines against the bright yellow background. There are no flaps on the breast pockets and the shirt and pockets do up with white buttons. 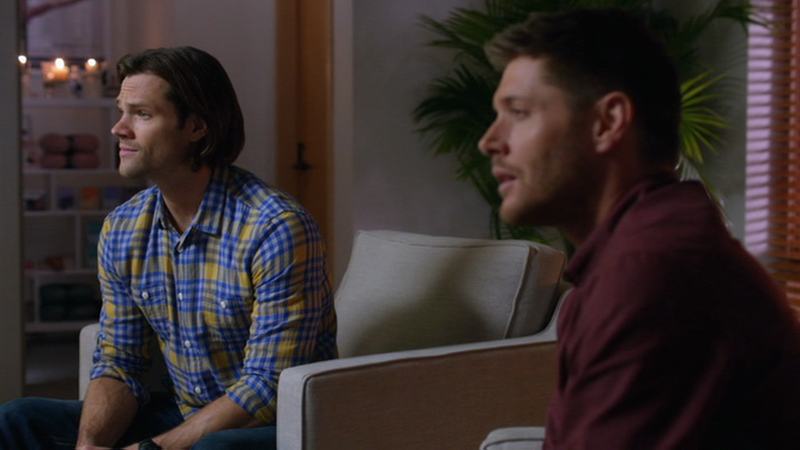 In The Purge (9x13), Sam wears this shirt when he and Dean are interviewed for the trainer position at Canyon Valley Wellness Spa. This shirt is so out of Sam's regular wheelhouse for shirts. He usually wears something with more muted colors, nothing this bright, this loud. I wonder what made wardrobe have him wear something like this. It is definitely OOC for Sam. The shirt is not too bad, but this is NOT a Sam shirt. Thank goodness he only wore it once. Way too loud for my tastes too. I really think the shirt IS bad as well as not being a Sam shirt. :P But then, I tend to go for muted colours myself, nothing too bright.